Apple’s lead designer is known for his influential designs of the company’s iPhone, iPad and MacBook. What you might not know is that he sometimes lends his hands to projects outside of the company, too. For example, in 2013 he designed a one-of-a-kind desk with Marc Newson, another legendary industrial designer. Commissioned by HIV/AIDS charity (RED), it was auctioned at the final price of $1.6 million. In the past, they also collaborated on a grand piano and custom Leica camera. This holiday season, the design duo is shifting their focus from products to plants — a Christmas tree to be exact. 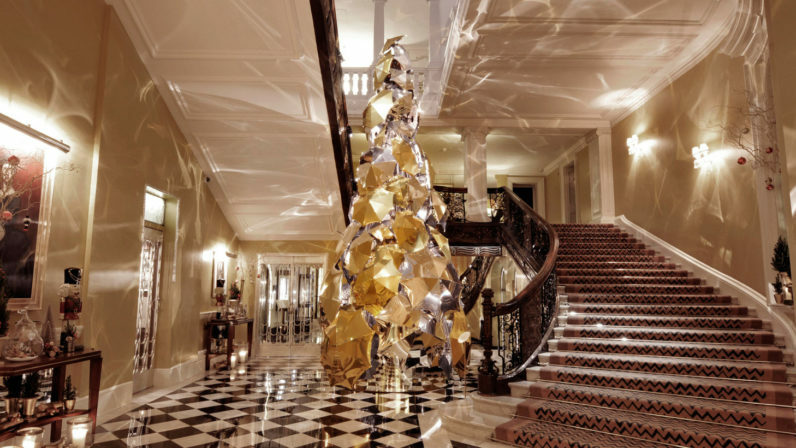 The tree has been commissioned by London hotel Claridge, and is part of their seasonal celebration. Previous designers of the temporary centerpiece include Dolce & Gabbana and Christopher Bailey of Burberry, whose design is pictured above. Its reveal will take place on November 18, and my bet is on it being very minimalistic — maybe even leaving off the leaves in favor of his beloved aesthetic.